How much did you eat for Thanksgiving? How much did you eat for Thanksgiving? Are you feeling that post-turkey guilt? Lots of people are hitting the gym to make up for all those calories. 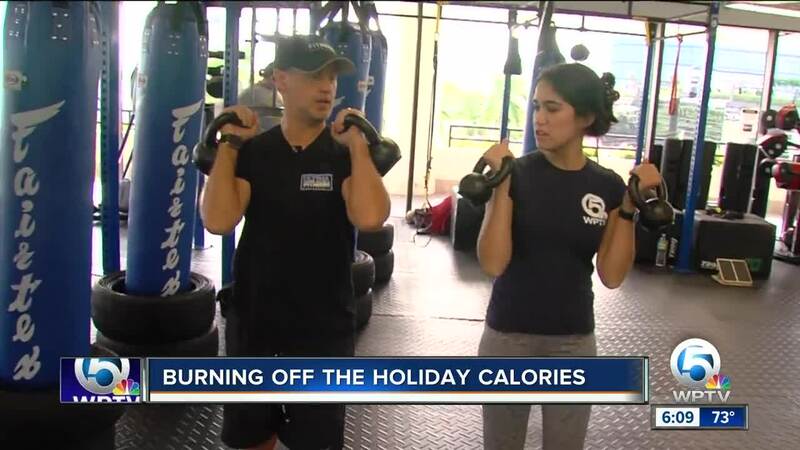 “Everybody has indulged in thousands of calories so they wanna come back in and get that burn going,” said trainer Ian Curren at Ultima Fitness Performance in West Palm Beach. How much did you eat for Thanksgiving? Are you feeling that post-turkey guilt? Lots of people are hitting the gym to make up for all those calories. “Everybody has indulged in thousands of calories so they wanna come back in and get that burn going,” said trainer Ian Curren at Ultima Fitness Performance in West Palm Beach. He went over some easy workouts with WPTV's Alanna Quillen — starting with weights. Rope workouts, pull-ups, boxing, tire flips, planks — anything with cardio is key. “We’re going for burn, we’re going for toning,” said Curren. Curren says as your body is moving, you’re working. “And it doesn’t matter if you do 10 to 15 minutes, you can do an hour. But work yourself up gradually," he said. Click the video to watch the various workouts.